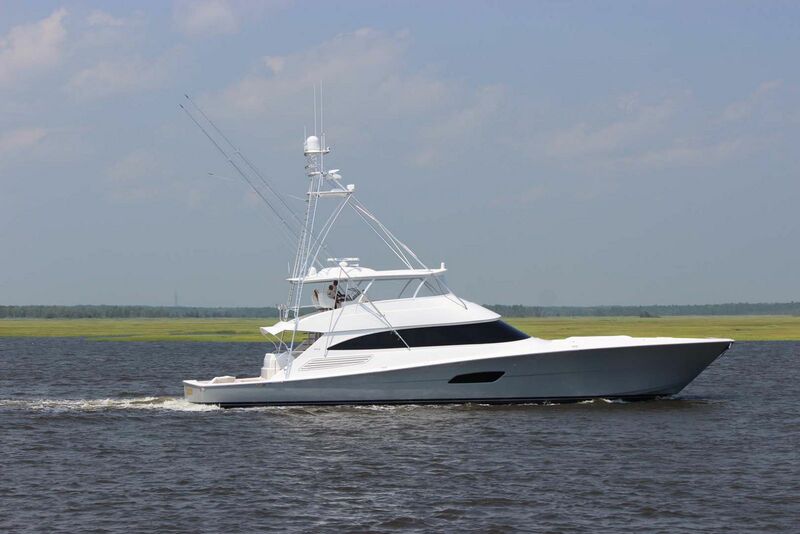 When Viking launched the 75MY, the goal was to have a luxury European-style motor yacht option for the Sportfish owner looking to do more cruising. 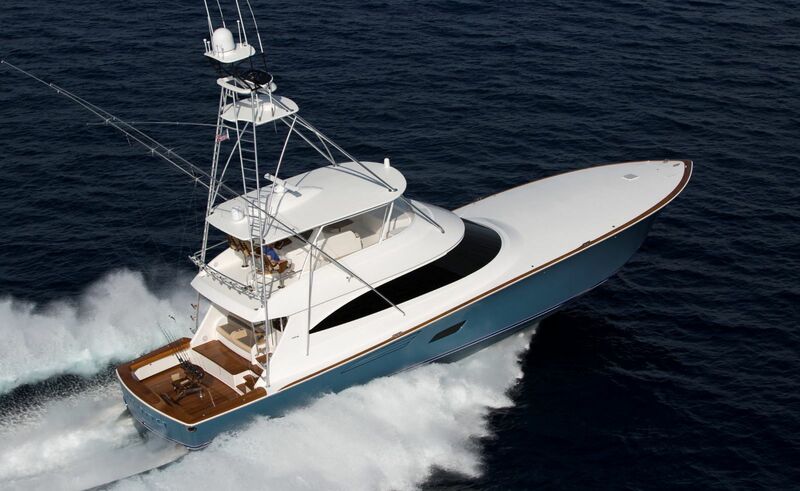 With Viking’s superior construction capabilities, the quality of the motor yacht line would be every bit as good as the world-renown Viking sportfish reputation. But like most anglers, the Viking tournament “fisherman turned cruiser” cannot get the hunt for big game out of their blood that easily. 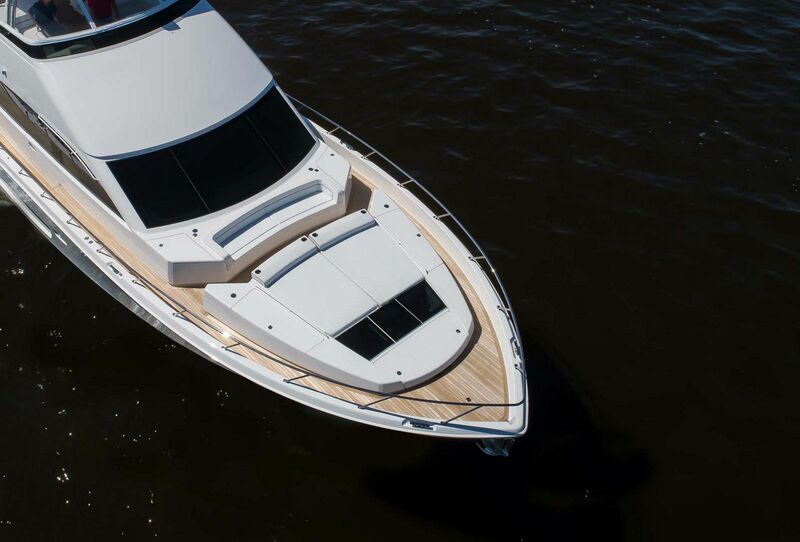 For the motor yacht owner that still wanted to fish, Viking created the all-new 82 Cockpit Motor Yacht. 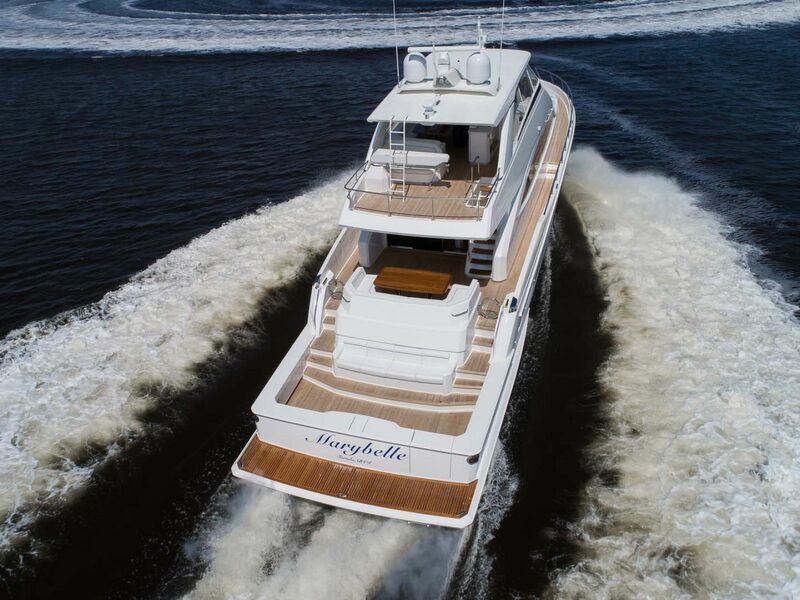 Combining the amenities and layout of a luxury, high-performance cruiser with a massive aft cockpit perfect for a fighting chair, the 82 Cockpit Motor Yacht is the perfect vessel to chase Marlin one week and cruise to Florida the next. 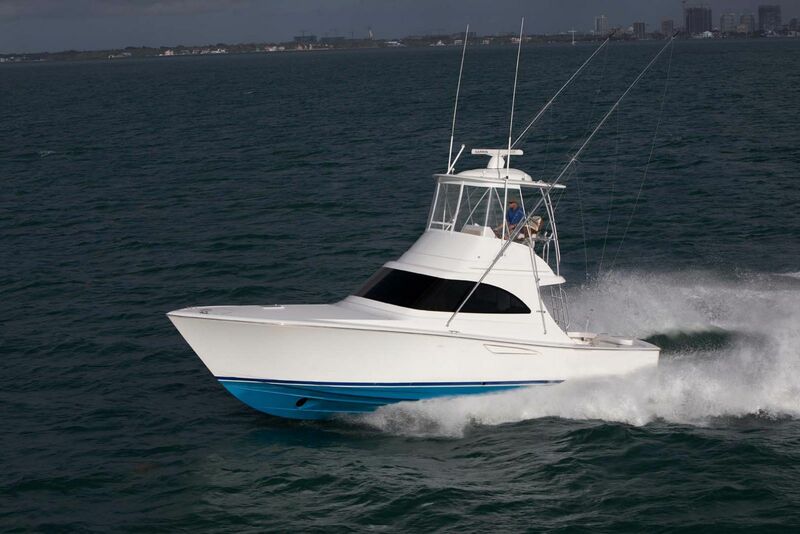 The cockpit of the 82CPMY is 108 square feet in space and can be customized with all of the fishing features you desire. Guests access the cockpit from dual teak staircases and can enjoy the space for diving, paddle boarding, and plenty of other water activities. 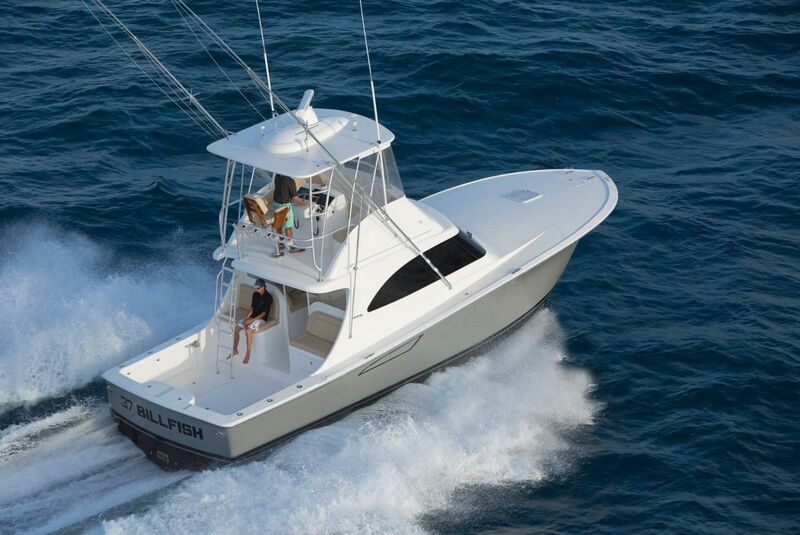 But for the owner-angler, Viking can add in rod holders, a livewell, storage for bait and tackle, and fighting chair. Guests on board can watch the action from Viking’s signature observation mezzanine with Sunbrella cushions and air conditioning. Heading into the salon, you immediately see the Viking touch with a sophisticated décor and luxurious appointments. The layout is open and inviting with plenty of opportunities for socializing and dining. The U-shaped lounge and coffee table faces a flat screen television with additional seating. There is a formal dining area that can comfortably fit 6 to 8 people adjacent to the galley countertop. A day head is also found port side on this level for convenience. 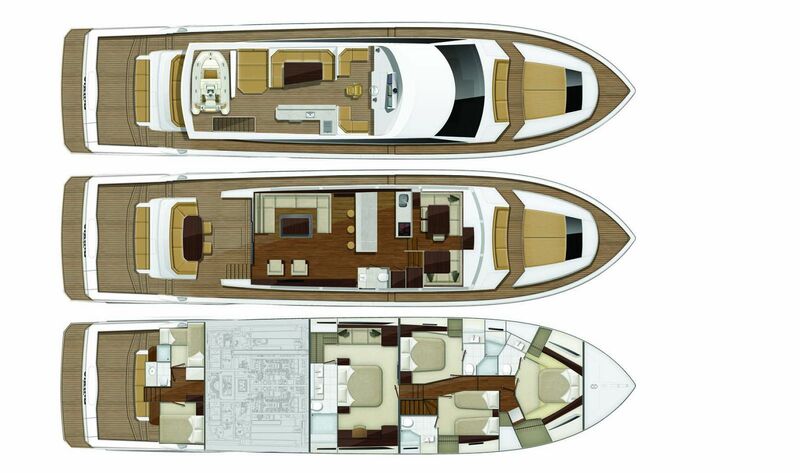 The standard layout on the 82CPMY consists of four staterooms each with their own en suite head. 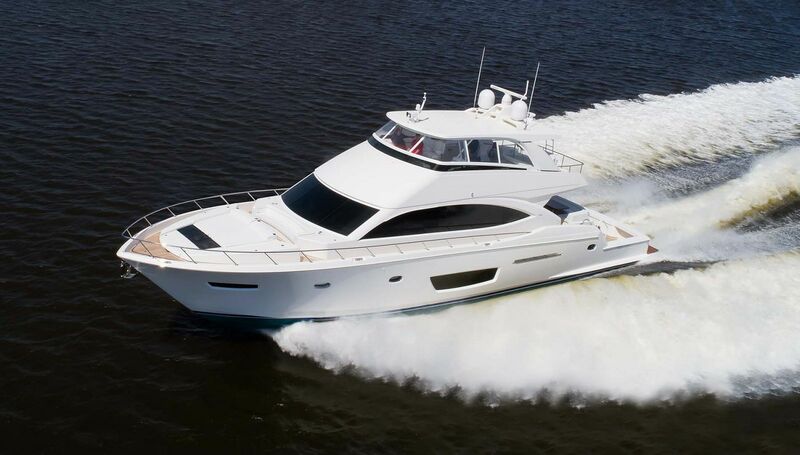 The master suite stretches the full beam of the yacht which results in the ability to place a king-sized berth mid-room with nightstands on both sides and plenty of room to walk around. There are multiple hanging lockers, plenty of storage, and a couch next to the entrance to the head. The master bathroom features his-and-hers sinks with a walk-in shower. Two additional guest staterooms have queen-sized berth while the fourth stateroom has side-by-side bunks. Additionally, there are crew accommodations for up to four that are accessed via a separate staircase aft. Owners are given several power options from MAN, MTU, and Caterpillar. The standard power on the 82CPMY are twin MAN V12 1550hp diesel engines, but owners can upgrade to the MAN 1800hp engines, CAT C32-A 1925hp engines, or the MTU Series 2000 V12 M96L 1945hp engines for maximum top end speed. 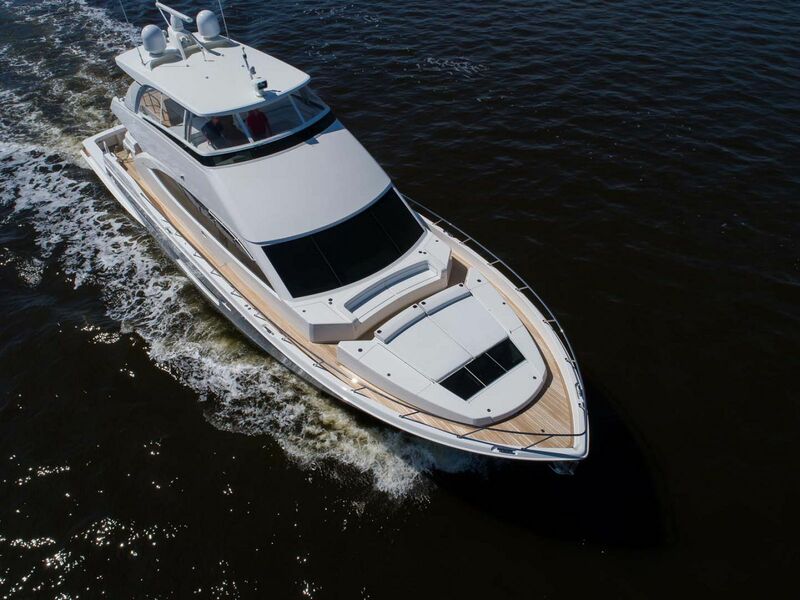 For more information on the Viking Yachts 82 Cockpit Motor Yacht, please contact your Staten Island Yacht Sales representative today.